The May 2017 issue of Choral Journal features an article in the Rehearsal Break column by Frank Eychaner titled “Step by Step: Collegiate Choral Auditions.” Below is an excerpt of the article, and you can read it in its entirety in the May 2017 issue! 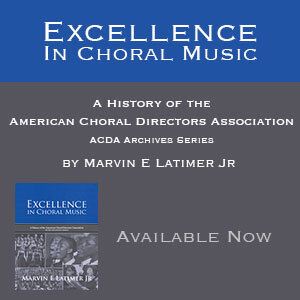 Go to acda.org and click “Search Archives.” Choose May 2017 from the dropdown menu. Choral auditions, rather than being an intimidating roadblock or a meaningless formality, are an extremely valuable tool. Done well, they lay the foundation for any future successes an ensemble may experience. Done poorly, they rob a choral group of the excellence it might have achieved. It is imperative that we develop an informed, systematic process to group singers with peers of similar ability, availability, and talent in the ensemble that will facilitate maximal growth. This article presents materials, processes, and a philosophy for conducting effective auditions for collegiate and other advanced ensembles. The audition should yield information that places students on a continuum from the least to the most skilled in a number of discrete musical areas. Beyond musical skills and aptitudes, all effective auditions will have components that allow the director to measure a number of extra-musical qualities and attributes in a potential ensemble member. Because the purpose of this assessment is to place singers in a group, a critical task of the choral leader is to come to know the singer well enough that they can place the singer in a group where their aptitudes, attitudes, and availability will allow them to thrive within the ensemble. Conduct the auditions in a well-lit room with a tuned piano. The time of the auditions needs to meet the needs of the program. Many directors schedule auditions in the spring for ensembles to be launched the following fall. This model helps build anticipation and momentum for the upcoming year. Also, knowing the makeup of groups in the spring allows directors to make informed decisions about repertoire during critical summer planning times and allows member excitement to grow. Shortcomings of spring auditions include the inevitable personnel changes forced by students moving out of a community. Other directors choose to conduct auditions in the fall when the school year, community choir, or church choir season begins. This model provides an even playing field for newer students. Enough time should be budgeted in each audition to have a brief but encouraging conversation with singers and to conduct the audition proper. Each director should formalize their audition process and conduct a couple of faux auditions with returning singers to determine how much time should be dedicated to each audition. It is critical to make sure an already nervous singer does not feel rushed during his or her audition. Before auditions begin, prepare a table or other area where singers will be greeted as they arrive. Have someone on hand to meet and engage each auditionee in conversation until the appointed time. These greeters could be current or former members, graduate students, or others in the organization. Greeters should be instructed to distribute the Vocal Ensemble Audition Form (see page 63) to singers as they arrive with instructions to complete the form before the audition begins. Singers can also be directed to a room to warm up, and helpers can guide them to the audition room when their time is at hand. In the event of delays or schedule changes, greeters can communicate the need to move auditions ahead or delay them. A warm welcome puts singers at ease and facilitates their prompt entrance. Read the rest of this article in the May 2017 issue of Choral Journal here!